YouTube baffles me. I use it when I want to find a clip I remember that was once on the telly, or, most often, to listen to music. It's like a reference library for the 21st century. Except it isn't. For many people, particularly the younger ones, it's almost like a TV. They have their favourite shows, which they look forward to each day, and, most importantly, they have their favourite Youtubers. Who knew there was such a thing as celebrity Youtubers? With one or two exceptions, I had no idea this was even a thing. 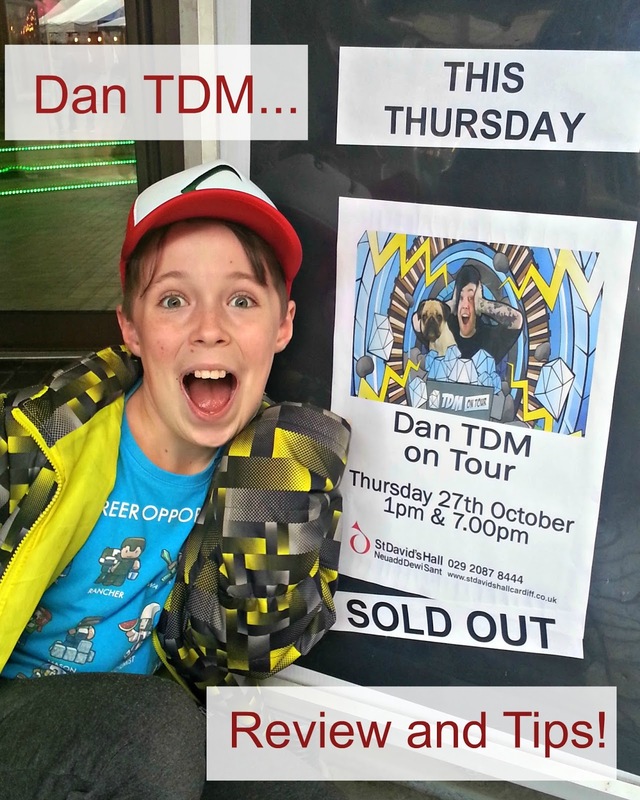 So I was amazed to find, when I went to book a stage show for L's favourite Youtuber, that it sold out pretty quickly. Yes, there are stage shows now and this one was actually pretty good. 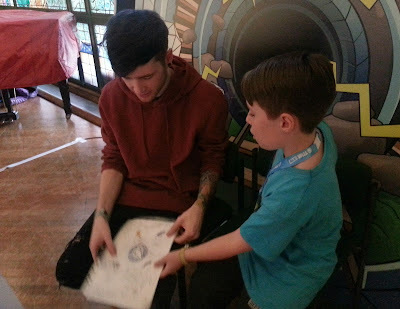 Two things I learned from this event, DanTDM knows his audience and there is a good reason why children love him. I had absolutely no idea what to expect from this event. The price was pretty reasonable, I thought, less than David Essex, and even a bit less than Rebecca Ferguson (nope, me neither! ), but how do a series of, albeit pretty amusing, Youtube videos, transfer to a 90 minute theatre performance? All would be revealed, but first; we had a very important date. Which was how I found myself in a Cardiff hotel room at 6.45 on a Thursday morning being woken by a fully dressed boy in coat and hat, asking why we weren't leaving yet. L has been a huge fan of DanTDM (The Diamond Minecart, to the uninitiated) since he first discovered Minecraft a few years ago. To him, the man is a legend. He watches him everyday, laughs at his antics, gives a *squee* at his little pug dogs and feels part of his world, exactly like you might with a TV actor or pop star. 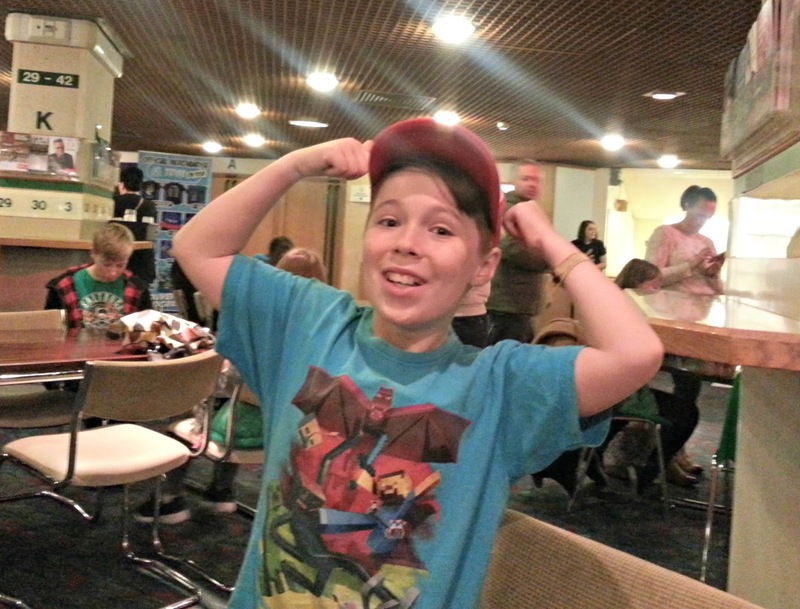 To L, DanTDM is a hero. So, when I heard (many, many times, over the course of several weeks) that he was coming to Cardiff, which is considerably closer than he's been on his previous signing events (what is wrong with Bristol, Dan? We have cider and graffiti!) I bagged some tickets and, because I knew it would mean the world to him, I also paid extra for a 'meet and greet'. The downside of this, is that it started at 8am, hence the hotel room, and L's excitement meant we were there promptly at 7.30. So there I was trying to keep warm outside St David's Hall, alongside several other excited little people, wondering what my life had become. The doors opened at 7.45 and we were handed a raffle ticket and ushered into a bar area, with tables and chairs and a small stage section. After about half an hour, the children were called up, 20 at a time and each one was given a few minutes with their idol and a photo. This was when I realised what a thoroughly nice fella Dan is. It turned out that the reason for the early start was because they had tried having a shorter turn around and a quick question and answer session after, but he wanted to spend longer with each of his fans, so changed the times and started his day two hours earlier. Despite the early start, he showed a genuine interest in L, who was completely overwhelmed by the whole experience. We were one of the first people in the queue for the meet and greet, and there were over 100 people with the tickets. So it meant a long wait for those at the back, but there were tables and seats and you could buy drinks and snacks at the bar. There was a lovely atmosphere and everyone was really friendly. Once you had collected your photo and goody bag, (which mostly consisted of a tshirt, but it was a lovely tshirt and the bag will be perfect for P.E.) you could leave and come back for the performance at 1pm, so we went off for some much needed breakfast. The meeting fans part must have taken a very long time and I am not entirely sure how he managed to fit everyone in, but it shows an insane level of dedication to his young fans to go to such lengths to meet as many as possible. When we left the venue after the performance, there were a large number of people already queuing for the next meet and greet before the evening performance, which wasn't due to finish until 10pm. Thats a seriously long day! The performance started pretty much on time and, I have to say, it was really entertaining. It was perfectly pitched to the young audience and everyone seemed to enjoy it. Sadly, he made us promise no spoilers, so I can't give anything away, but I will say if you know someone who's a fan, it's a really fun show. Personally, what I took away from the performance was that this is someone who appreciates his fans and comes across as a genuinely nice guy. L felt really encouraged by him and is even more enthusiastic about helping with our Youtube channel than he was before. Someone who can create that much inspiration and joy in his audience of young people is welcome in my living room anytime! Get There Early. We had a huge advantage thanks to L's enthusiasm. We got there half an hour before the event was due to start, but they opened the door fifteen minutes early anyway, so we only hung around for a short while before we could go in and sit down. However, it meant we were in the first 20 to go up, then we could go off and do something else before the show started, saving a lot of waiting around. Take a Souvenir for Signing They allowed everyone to take up one thing to be signed, and there were lots of souvenirs that you could buy, but, like a lot of event souvenirs, they weren't cheap. However, if you have something special already, or just want to save a few pounds, you could bring an item with you. Take Your Camera The event has a few rules, because there are a lot of people to get through, so they have to be fair to everyone. One is that Dan can't pose for lots of selfies, although you do get a lovely professional photo anyway, but children are allowed one adult companion and they don't mind if that person takes photos of the child meeting Dan. Take Something To Do If there are many over-enthusiastic fans, or you can't get there early, you may find you have a long wait for the meet and greet. This is unavoidable, obviously, because he can't meet everyone individually at the same time. They did have a TV showing the DanTDM Youtube channel, but it might be an idea to bring something else to amuse, if that isn't really your thing. taking of youtube, I looked at meghans last night and found a youtube video of her and luke jumping on my bed!! Ahh! How fab! I'm glad you had a great time. Thanks for this! I was trying to decide whether the M&G was worth it (it's $95 per kid here in Durham, NC) and your blog post was a big help. 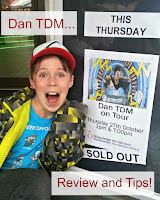 My kids (thankfully) don't have many "celebrity" idols, but DanTDM is one of them. I think it will be money well spent. Cheers from the US! I am so glad it helped. I hope they have a lovely time! Tried to get into the meet and greet in the Nashville show but we didn't have any luck. Sure hate my son will miss that. 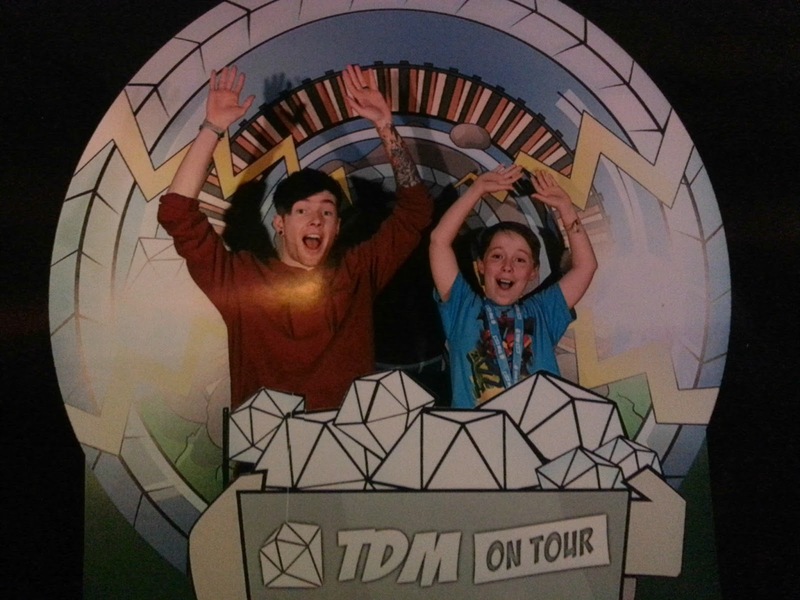 DanTDM is his absolute favorite. So sorry to hear this! From his Youtube videos, it looks like he's having the time of his life, so fingers crossed he will be back again. Thanks for this. I am taking my sons to see him in Seattle on Sunday. I haven't had the slightest idea what to expect. Will he sit in a comfy chair onstage and just play video games on a jumbotron? Your write-up gives me a good feeling that the kids will have a grand time.